Unassuming and understated, but packed with hoppy goodness! These natural-finish wood carrying cases are the perfect 'thank-you' for wedding guests to take home, enjoy, and reminisce over the fabulous day of nuptial festivities. Each bottle of home-brew is hand labeled, and a warm thank you note tied with ribbon dangles from the handle. Each guest table is decorated with a simple, white tablecloth, dusty rose colored lace doily, beer caddy, and battery operated tea light in mason jar. Location: 224 Riversong Lane, Priest River, Idaho 83856. 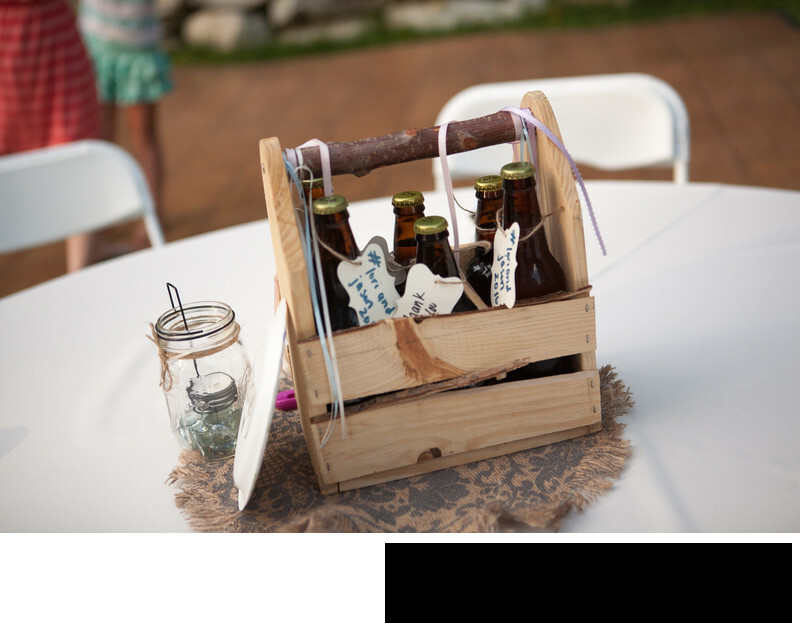 Keywords: coeur d alene wedding (3), diy wedding (3), homemade gift (3), party favor (3), priest lake wedding (3), priest river wedding (3), spokane bride (3), wedding (3), wedding beer (3), wedding inspiration (3), wedding photographer (3).